Cautious buyers causing housing market’s downward trend, says C.A.R. California home sales declined for the eighth straight month in December 2018, according to the latest housing market report for home sales and prices from the California Association of REALTORS® (C.A.R). The year finished with fewer sales for 2018 for the first time in four years. For the year as a whole, sales statewide were down 5.2 percent from 2017. December’s sales figure was down 2.4 percent from the revised 381,400 level in November and down 11.6 percent from sales in December 2017 of 420,960. December marked the fifth month in a row that sales were below 400,000 and the lowest level of sales sold since January 2015. Sales in San Diego in December 2018 were 7.4 percent lower compared to November 2018, and down 14.7 percent from December 2017. C.A.R. said the statewide median home price in December 2018 was $557,600, which was up 0.5 percent from $554,760 in November 2018 and up 1.5 percent from a revised $549,550 in December 2017. The statewide median home price for the year as a whole was $570,010, up 6.0 percent from $537,860 in 2017. In San Diego, the median home price in December 2018 was $618,500, which was 1.2 percent lower than the $626,000 figure for November 2018 and 2.2 percent higher than the $605,000 figure for December 2017. Closed escrow sales of existing, single-family detached homes in California totaled a seasonally adjusted annualized rate of 372,260 units in December 2018, according to information collected by C.A.R. from more than 90 local REALTOR® associations and MLSs statewide. The statewide annualized sales figure represents what would be the total number of homes sold during 2018 if sales maintained the December pace throughout the year. It is adjusted to account for seasonal factors that typically influence home sales. The median number of days it took to sell a California single-family home rose from 25 days in December 2017 to 32 days in December 2018. 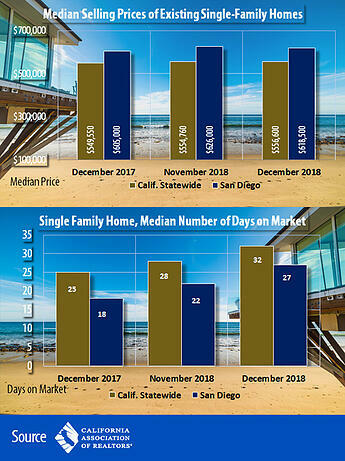 Meanwhile, in San Diego County, the median number of days a home remained unsold on the market was 27 days in December 2018, compared to 22 days in November 2018 and 18 days in December 2017. A new Zillow survey found that 27 percent of new homes in San Diego County experienced some price reduction in the fourth quarter, a 5 percent increase from the first quarter of 2018. Nationally, Zillow found that 25 percent of new homes experienced a price reduction in the fourth quarter, compared with 19.2 percent of homes in the first quarter of last year. Zillow said home shoppers nationwide may be able to find a better deal on a new home now than they could a year ago. Price cuts were more common in the fourth quarter than in the first quarter of last year, Zillow reported. CoreLogic recently reported that San Diego home prices were up 1.1 percent in November, after two months of decline. The real estate tracking company also said the median price in November was $565,000, which was $18,000 less than an all-time peak reached in August. 2018. The national economy is cooling but whether a recession is around the corner and how much a slowdown would affect the San Diego area is still an open question, according to local economists who met at the annual San Diego County Economic Roundtable at USD. San Diego County is one of the least affordable places to live in America, and renters know it. In 2017, 57 percent of the county’s renters were considered burdened by their housing costs, meaning they spent 30 percent or more of their income on rent and utilities. The figures come from data recently released by the Census Bureau’s American Community Survey. The problem is even worse for the 28 percent of renters in the county who spent more than half their income on rent and utilities in 2017. People with higher rent burdens are more likely to skip doctor appointments and avoid paying for medications, and they are less likely to save money. Demand for rental apartments has reached near record highs in San Diego, according to RealPage, a national property management and software company. San Diego was among 17 metro markets where apartment occupancy rates were at their highest in the third quarter of 2018, higher than they’ve been in the past 15 to 20 years. Occupancy rates in San Diego were the highest they’ve been in about 15 years, the company said. A new survey suggests a general dissatisfaction with the way things are going in California, mixed with politics to create a highly toxic brew. According to Competitive Edge’s recent poll of 806 likely voters, 15 percent of voters are seriously considering leaving and another 13 percent are giving it some thought. According to a recent survey from the Public Policy Institute of California, the 60 percent of respondents identified as likely voters are predicting that children growing up today in California will face a bleaker financial furniture than their parents. Sixty-seven percent of respondents said that the state was divided into haves and have-nots, and 45 percent considered themselves have-nots. San Diego County’s job market finished 2018 on a strong note. The local non-adjusted unemployment rate remained at a historic low of 3.2 percent in December, according to the California Employment Development Department. That’s unchanged from a revised 3.2 percent in November and below the 3.3 percent rate a year ago. The county lost 1,500 net positions in December. But year-over-year, payrolls added 28,400, up 1.9 percent.